Our tree is up and there are garlands and white lights everywhere. Since we don’t use a real tree, though, we miss that wonderful smell of a freshly-cut Christmas tree. Instead, we fill the home with other wonderful scents with crafts and pretty decor. This year, we decided to make some fragrant holiday decor pieces with mandarins and cloves. Mandarins give off such a wonderful citrus fragrance, and when they’re combined with the unique scent of cloves, the result is an amazing holiday scent! We always have plenty of Halos mandarins around this time of year, so I used some for our holiday centerpieces. I used a bar tool to remove the peel from the Halos in different designs, leaving some of the mandarins whole. Then the kids and I took turns decorating some of the Halos with whole cloves. The cloves have a sharp end so it was easy to pierce the peel and push the clove all the way in. The results looked beautiful and smelled absolutely amazing! I was lucky that there were still enough Halos left in the house to make my centerpieces. They’re one of my kids’ favorite snacks, so every time we buy them they go fast. 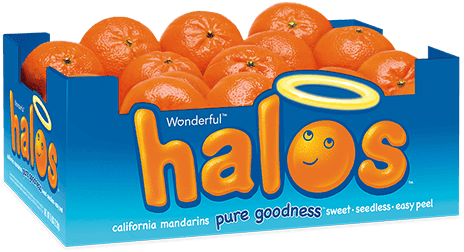 Halos are in season from November through April, so it’s the perfect time of year to grab some. And they’re 100% California-grown and absolutely, positively non-GMO, so they’re a healthy snack you can feel good about giving your kids. Be sure to grab some Halos next time you’re out grocery shopping. Don’t forget to grab a few for your holiday centerpiece before the kids gobble them up! Fruit is fun! Get your family excited about fresh foods with sweet, healthy reminders all year long and activities they’ll love. Check out the FREE HalosFun kids’ app on Android or iPhone for more ways to get them cheering about pure goodness. You can learn more about Wonderful Halos on Facebook, Twitter or HalosFun. Thanks for this. I’m going to do this. I remember my Mom always did this during the Holidays and the smell was wonderful. I love this!! I bet it smells incredible. I love mandarin oranges, and these are the best because they are seedless. I need to pick some of these up for the Holidays! That looks absolutely beautiful and I can only imagine the heavenly scent. Love this, Mickey! I can smell it from here! Ahhh… we used to do this when I was growing up. I’m pretty sure if I tried to do this now my kids would disown me for taking away their precious Halos. How nice! I love clemintines, tangerines, and oranges. Such a wonderful citrus smell. I remember making these when I was little. They smell so good! I love winter and Christmas centerpieces that incorporate nature. They’re just so fitting for the season. I’ll bet these centerpieces smell amazing with the addition of those Halos!